The video debuted on Chinese websites on February 28, 2015. A week later, more than 200 million Chinese--about a third of the country's online population--had watched it. 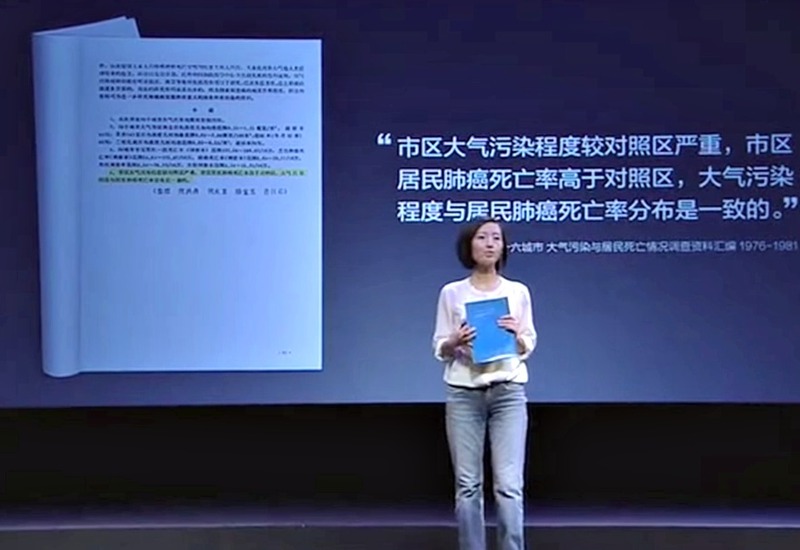 On March 6, 2015, official censors ordered the video removed from all Chinese sites. Viral doesn't even begin to describe this spring's wild ride for Chai Jing's "Under the Dome," a 104-minute documentary on air pollution in China. Chai, a journalist and environmental activist who worked for China Central Television until 2013, financed the film with more than one million renminbi ($160,000) of her own money. She did extensive reporting among scientists, industry leaders, government officials and even schoolchildren to put together this devastating critique of China's smog problem. The documentary is similar to Al Gore's film "An Inconvenient Truth," blending a TED-style talk on stage with short filmed pieces and a blizzard of charts and graphs. Much of what Chai included in the documentary has been reported before, but she skillfully weaves together topics like diesel refining and bureaucratic corruption with information on atmospheric chemistry and the history of smog across the globe. It was a personal touch, however, that seemed to strike a nerve with her Chinese audience. One of my favorite parts of the documentary comes toward the end, where she asks a few of her interviewees--scientists, corporate leaders, municipal government workers--to describe the gone but not forgotten blue skies of their childhoods. We have no right to consume without restraint, we have no right to complain without building anew. We have a responsibility to prove...that a world illuminated by energy can, at the same time, be clean and beautiful. Your choice of clothing can speak for you. It's difficult to find a review or news article about "Under the Dome" that doesn't mention Chai's outfit on stage: casual white blouse and jeans, no flashy jewelry or expensive-looking shoes. In interviews, Chai said she was prompted to make the film out of concern for her newborn daughter's health, and the outfit plays up the mom in her. She wears a variety of other outfits in the investigative video portions, including a field jacket at a steel plant and business suit inside government offices. But her personal narration on stage is underscored by her simple, down to earth clothing. Use questions to give structure to your speech. This documentary is a master class in the many ways to use questions within a speech. Chai uses questions as a lead-in to explain the science ("What would I say if my daughter asked me, 'What is smog? '"); as a way to point out what's going to come next in the talk ("I decided I needed answers to these three questions..."); and as a way to anticipate arguments ("People in China all grew up on coal stoves to stay warm, so why didn't they all have cancer?"). Use the invisible visual. In a documentary that includes animated pollution particles dressed as gangsters and footage of lung cancer surgery, you'd think there would be less need for descriptive language. But "Under the Dome" is full of invisible visuals as vivid as any video. Here's one of my favorites, about the city of Harbin viewed from the filthy air: "When you looked down, it was like 12 million people were buried under cement." It's still banned in China, but you can watch the full documentary, with English subtitles, below.